Prices have increased while we await our new site. 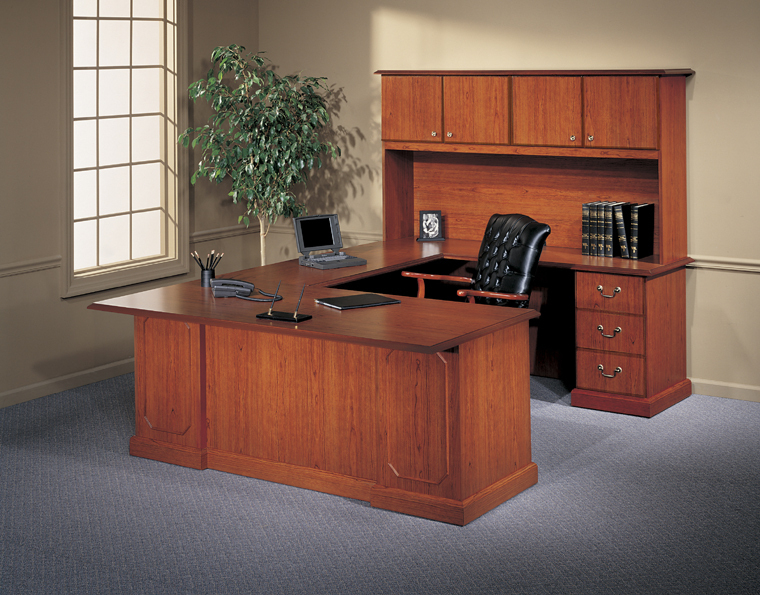 Fulton all laminate casegoods combine extreme durability and traditional styling to ensure long-lasting protection of office spaces for years of dependable service. 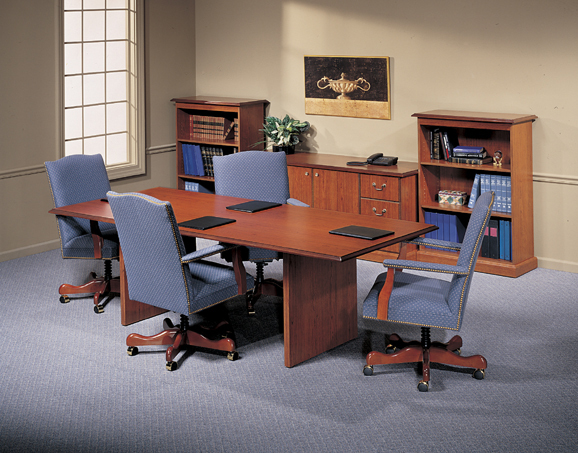 A smart selection of configurations is available in two laminate finish choices. 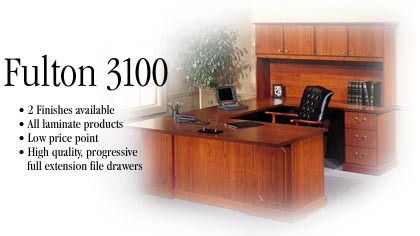 Fulton components are manufactured to endure common dents and scratches from everyday use, ensuring long lasting and attractive office furnishings. Desks feature central locking, pull out writing shelves, full extension file drawers, decorative pencil molding and decorative antique brass hardware. 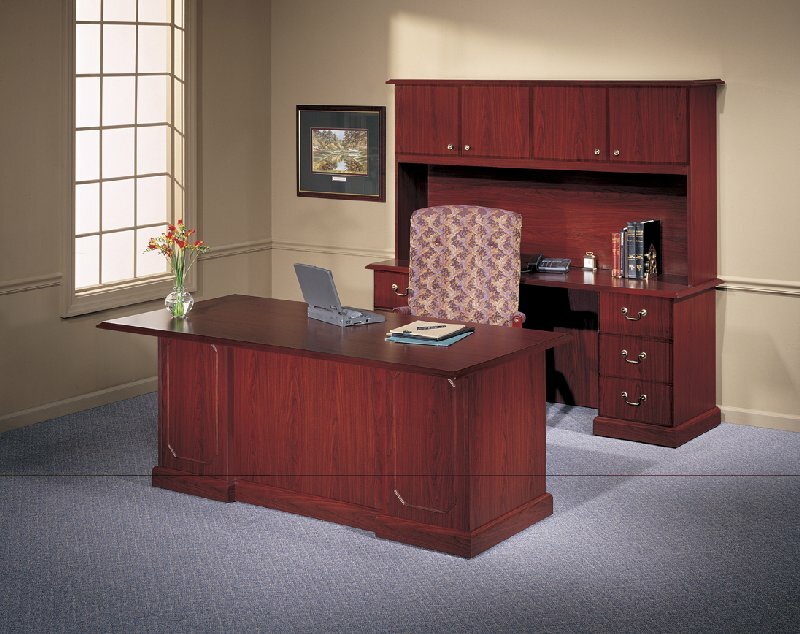 The Fulton Collection is offered in Medium Cherry and Natural Mahogany laminates. High pressure laminate worksurfaces with thermo-fused chassis for scratch free, chip resistant surfaces. 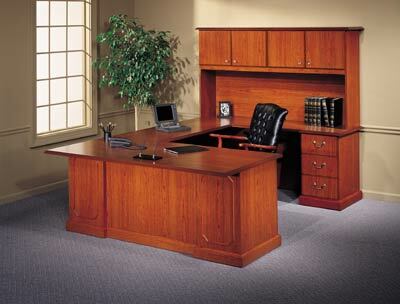 Drawer interiors are oak-grained, medium density fiberboard with rigid five sided construction. 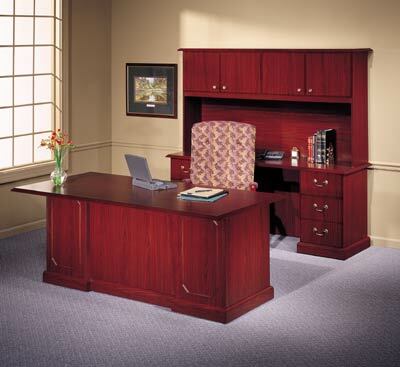 Central locking system locks all drawers with the turn of a single key. Feature pull-out writing shelves for additional work surface. Feature letter or legal filing, progressive full extension slides with precision ball bearings for smooth and quiet operation. Decorative brass drawer pulls compliment fine traditional design. Grommets in back panels of Executive Returns, Bridge Units, Credenzas and hutches allow for easy routing of wires. Indiana Furniture is currently on sale. Shipping is additional. For a business delivery with a dock. (The freight company will get the cartons to the end of the trailer and then it is your responsibility to get the furniture off the truck). By List Price from 0 to $3,000 freight charge of $200, $3,001 to $6,000 freight charge of $300, $6,001 to $9,000 freight charge of $400, $9,001 to $12,000 freight charge of $500, $12,001 to $15,000 freight charge of $600, $15,001 to $18,000 freight charge of $700, $18,001 to $21,000 freight charge of $800, above $21,000 call for quote. Zone 2 add $200. Residential delivery add $100. Lift gates are available for additional charge, call 856-368-9085 for details. 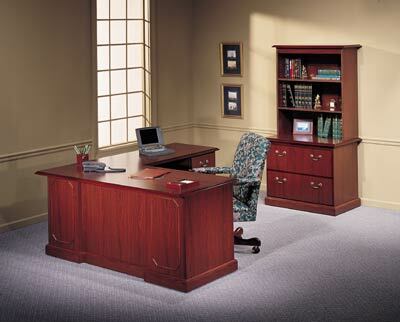 Installation can also be arranged for an additional charge. Call 856-368-9085 for additional details.Please check the Zone Page for your state and shipping information.